Note : Axillary vein access denotes any venous access lateral to the medial border of the first rib. From a semantics point of view – this also includes the extrathoracic part of the subclavian vein. 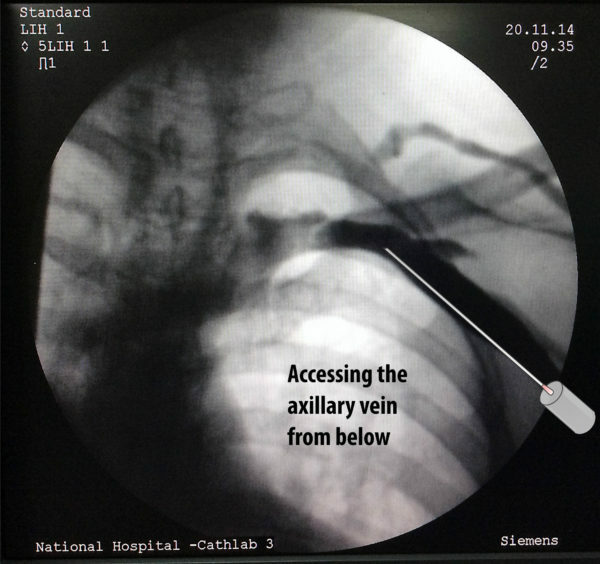 Keeping in common use, axillary access is the preferred term as – extrathoracic subclavian vein access is a mouthful. Figure : The first rib guided method. 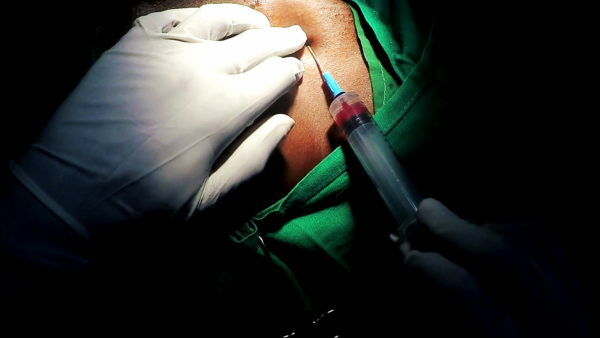 This approach is from below – aiming towards the root of the neck while observing the tip of the needle approaching the first rib at an angle about 45 degrees to the body surface. 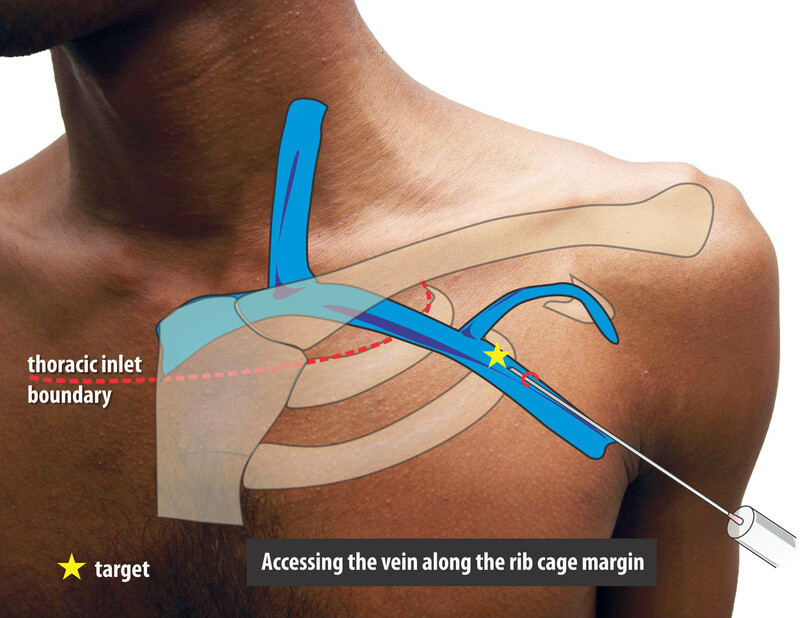 The target is the extra-thoracic component of the subclavian vein as it lies over the first rib. This is below the juncture where the clavicle crosses the first rib in AP view. This approach is from below – aiming towards the root of the neck while observing the tip of the needle approaching the first rib at an angle about 45 degrees to the body surface. 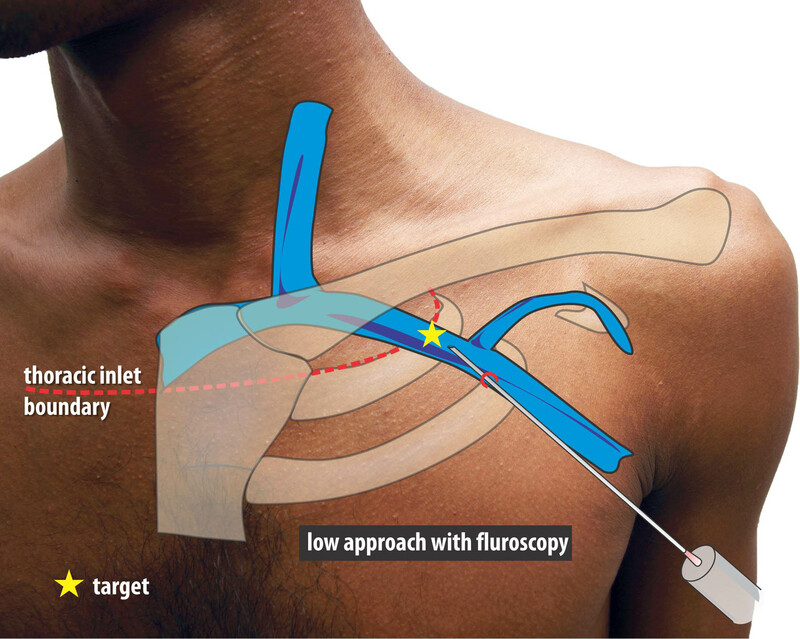 The target is the extra-thoracic component of the subclavian vein as it lies over the first rib. 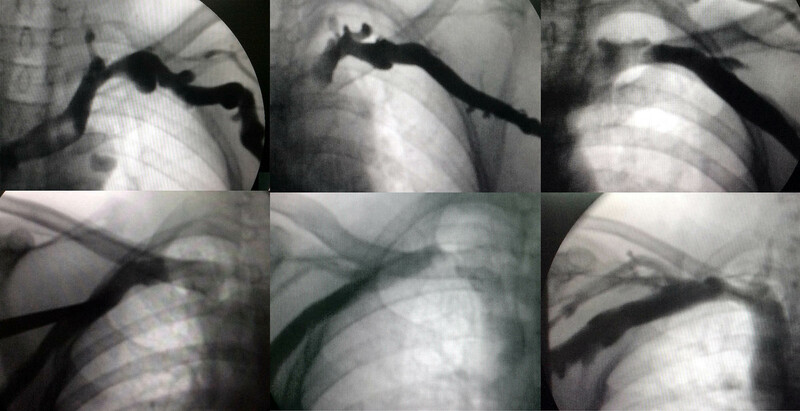 As shown in an example venogram, this is below the juncture where the clavicle crosses the first rib in AP view. While aspirating, the needle is gently advanced until the tip lies in the shadow of the first rib. 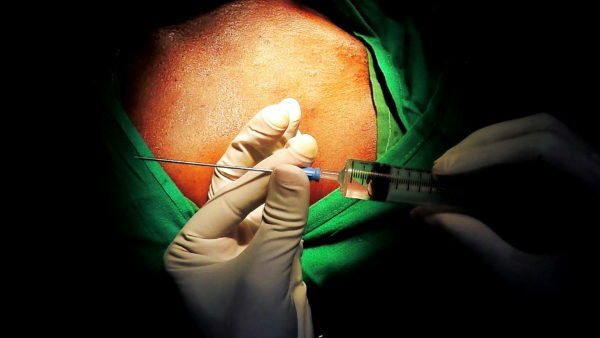 If the needle pierces the vein, blood would be aspirated and the advancement is stopped. 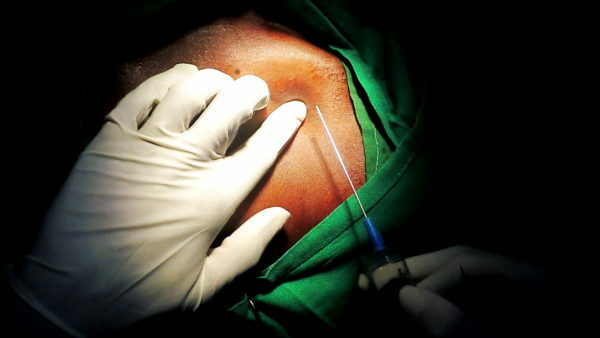 However if the vein is missed, the needle will continue deeper – but will hit the rib, which is the central safety feature of this technique to prevent a pneumothorax. However it is paramount not to advance the needle tip beyond the medial border of the first rib as one cannot assess the depth of the needle in AP view, when advancing it an angle. If the bone is hit, then the vein is either anterior or posterior to the current needle plane. Th needle should be slightly withdrawn and slightly angulated to point either further posterior or further anterior on the rib and re-advance with aspiration. This is called “walking” the needle tip along the rib surface. 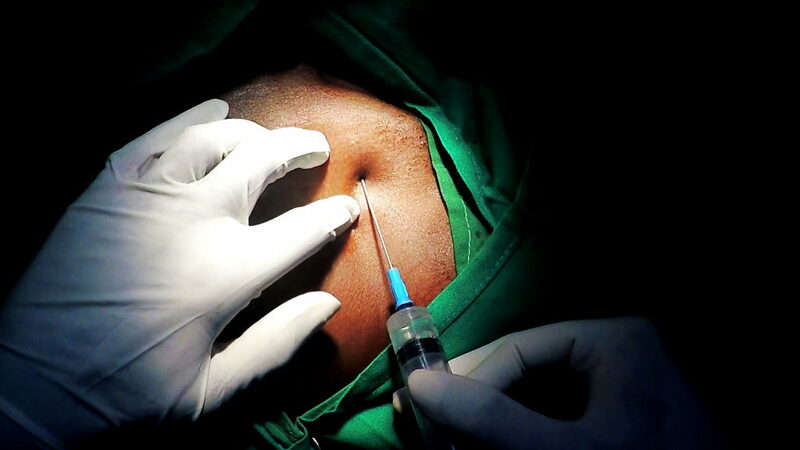 If one does not hit the rib and it the needle tip is seeing going medial to the rib border, then must assume being in the wrong plane and re position the needle. If a venogram has been not done and puncture has not been obtained after few dry fluorscopic passes, its advisable to do a venogram to assess anatomy. More than venous obstructions or anomalies, the most common culprit is a vein that is crossing slightly posterior or anterior along the first rib. Occasionally one may hit the artery – especially in elderly patients – whose vein may be quite anterior. In this situation if possible save the fluroscopic position of the needle before withdrawing it – this becomes a useful reference point for the subsequent punctures. I.e now the needle should be more medial (i.e. closer towards the sternal edge) to gain access to the vein as the vein lies medial to the artery. Even in the presence of a venogram, it is essential not to breech the medial (inner) border of the first rib because of the angle of the needle – one may be encroaching the pleura. A fluroscopic technique on assessing the depth is given in the next section on troubleshooting. The following method (described by : H. Burri et. al.,) is an elegant way of approaching the vein and the it’s the authors’ preferred way of access if the initial blind punctures fail (before doing a venogram). This technique relies on identifying a radiologic landmark and guiding the needle towards it. This approach has a minimal risk of pneumothorax as the needle is outside the pleural margin. When one reviews venograms it will be seen that the axillary vein appears to lie across the rib cage at the confluence of the second and third ribs in a relatively constant fashion. 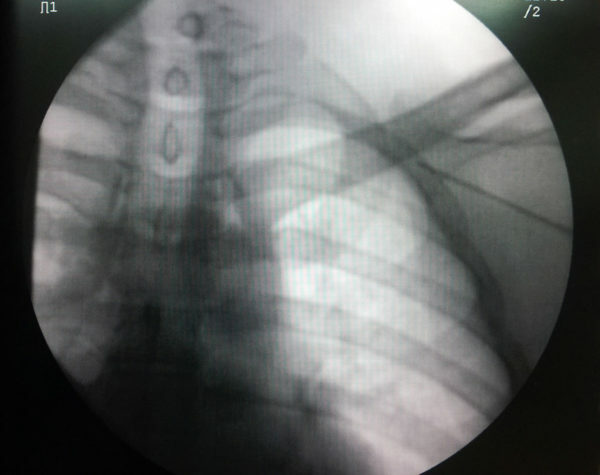 This “edge” of rib cage formed by the second and third ribs will be the radiologic target for the needle. Figure : Needle Position when targeting this area. Note that the needle is virtually outside the rib border and aiming to skirt along the confluences of 2 and 3rd ribs. The depth of vein at this point is quite deep and one may have to achieve an angle of attach of about 45- 60 degrees to reach the vein. As long as the medial border of the rib margin is not breached, one can be safe from a pneumothrax. The needle is advanced at a skin angle of 45 degrees aiming towards base of the neck.